Katie and Gay Hendricks have a solution. Do you have a hard time moving on after you've had a fight with your mate? Is there a part of you that thinks you shouldn't give in so easily after you've been upset - maybe even that you should make your partner work hard to get your full attention again? If you've had the same issue with your partner at least three times, that's a sure sign that you're unconsciously perpetuating the pattern - and that projection is likely the culprit. Remember, relationships are a dynamic. Often, both partners are bringing complimentary wounds to the table that cause them to repeat a negative pattern and project past pain onto their partners. Because the dynamic is unconscious, they remain locked in a battle and can't see their way out... unless they're able to uncover those underlying triggers.If you answered yes to any or all of these, then you feel you just can't let go of the hurt. You can't get over what your partner has said or done, or what they didn't do. You're not feeling loved, and it hurts. And you're certainly not ready to forgive. We want you to consider something quite radical - something you might at first want to completely write off. In fact, you might get so angry with us, that you'll want to delete this message. When you're this hurt and convinced your partner is the cause of your pain, you're almost certainly projecting. And when you project, you wholeheartedly believe your problem is one thing, but it actually comes from something else. Projection happens when we blame our partners for old hurts. We don't do it consciously. 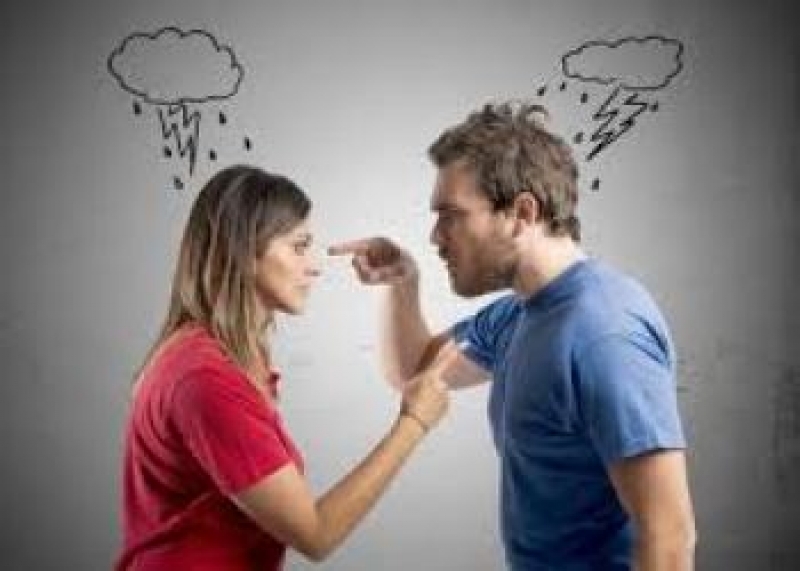 Conflict triggers unresolved issues from our past - including childhood wounds and disappointments from previous relationships. But projection keeps us from understanding the true source of our pain. When you're convinced your partner is to blame, you're unable to see how your past has contributed to what you feel in the present moment. You cast a blind eye to the fundamental issues that are triggering you now. Moreover, projection prevents us from resolving those underlying issues, thus recycling the same negative patterns again and again. And unless you recognize and address the projection, you will keep repeating the same patterns in this relationship or from partner to partner - preventing you from truly moving on from fights and authentically connecting with those you love. Righteousness: When you're projecting, you're 100% convinced you're 100% right about the situation at hand - and you're certain your partner is at fault. You'll feel angry, your brow will furrow, and you might even assume an intimidating posture over your mate. Feeling Wronged: If a minor argument with your partner leaves you feeling deeply hurt, and you experience a feeling of sadness in your chest, then you're likely projecting something from your past onto them. Maybe it was a parent who let you down, or it could be a situation from your school days when you felt as if another kid got away with something he did to you. Feels like life or death: Have you ever felt an overwhelming sense of anxiety or panic during an argument with your spouse? The need to resolve something right here, right now is a signal that you're likely bringing a past traumatic event into the present moment. Blaming your partner keeps you from discovering your part in the dynamic, and it results in what we call an "entanglement." Entanglements may look like relationships on the surface: you spend a lot of time together, maybe you even live together. You're a "couple." But entanglements lack a central component of real relationships: harmony. And projection is a key characteristic of entanglements. When two people are unconsciously playing out old wounds with each other, they create a situation fraught with blame and discord - the opposite of a harmonious relationship. The common ways partners unwittingly project past hurts onto each other - and end up fighting about the wrong thing. How to turn an entanglement into a harmonious relationship - one that is free of blame and criticism.